Can you crack this century-old code? With a few clues from an old postcard, photograph or letter, it is sometimes possible to piece together a profile of the lives of the people who owned them. Tantalisingly, these exercises often open up even more questions that may never be answered. On Monday July 20th 1908 at around 8pm, this postcard was sent on its way. 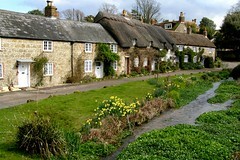 It was posted in Newport on the Isle of Wight, quite possibly near to the scene it depicts (below). Much of the message is straightforward, but who is it from? What are the messages concealed by code? I was very sorry that I could not come out last night there was still a leakage in the bicycle tyre. Will see you to-morrow (Tuesday) I hope. Will you please inform Edith that I did not see her on Saturday, of course you know I would have spoken if I had seen her. Tell her next time she happens to see me, to talk to me like she do her class at school or hit me over the head with her umbrella. ???? Hed(?) Baker & George. Remember me to all please. Hoping to see you tomorrow night & make arrangements. Bedmate? Is that what it really says? In 1908? Back in the early 20th century, there were several post deliveries a day, so a postcard referring to the next day would not have been uncommon. In some respects, postcards such as this one might have been equivalent to sending a text message today. By 1908 pillar boxes had been around in Britain for over 50 years, so the practice was commonplace. But would the messages all have been so brazen? Is this brazen at all, or am I mis-reading the signature? Who is this young lady? Well, without a name to go on, I have been unable to find out. But I have discovered the identity of the young man to whom she was writing. 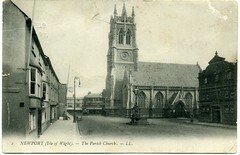 William Gabriel Critchell was born in May 1890 in Newport, the county town of the Isle of Wight, so would have been 18 years of age when he received this postcard. His father was a Wheelwright, (the son of a fisherman from Dorset), and his mother had been born in Hampshire. By 1901 the family had moved out of Newport to Rose Cottage in Calbourne (a small village, even today). 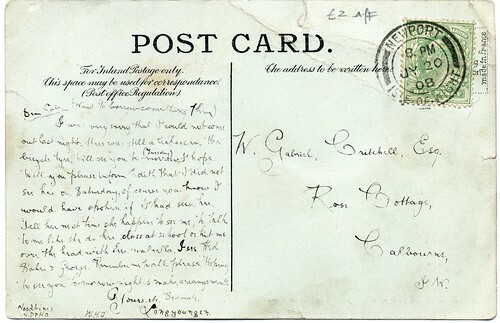 The month after this postcard arrived, Gabe Critchell enlisted with the Army Ordnance Corps. He had been apprenticed as a carpenter to Herbert Long, a Builder in Calbourne, but was still living at home. He had apparently been previously rejected for the military on the grounds of having bad teeth! From his service record it can also be found that he was 5’7½” tall, weighed 123lbs, had a 33″ chest and was of dark complexion with dark brown hair and brown eyes. Now he is a real person. We can picture him. On January 27th 1916 Gabriel married Lilian Sarah Harris in Putney. She was born in 1893 in Essex. It is not impossible that she is the author of this postcard, but it seems unlikely at this stage in the research. He transferred to the Reserve in 1919 and was discharged from the Army in 1920 having been temporarily promoted to 2nd corporal (military buffs please feel free to interpret that in the comments) and later acting sergeant. His address is given as High Street, Newport (back to the Isle of Wight). I know of no circumstances that would in any way disqualify him for a Colonial Govt. appointment. In 1924 we find him returning from Lagos and his given occupation on the passenger list is Builder’s Foreman. His British address is in Essex, his wife’s home county. Six years later and he returns to these shores again, now as an Inspector of Works. In 1932 his wife Lilian returns, seemingly alone, and Gabriel in 1934. In both cases their address is given as c/o Barclays Bank, Essex. Gabriel is listed as a Civil Servant. In 1936 and 1940 the couple return together and he is a Govt Officer. It is not clear whether they live in Nigeria and visit ‘home’ or the other way around. They lived in Windsor from at least the mid 1950s and William Gabriel Critchell died in January 1960 in Windsor, leaving Lilian a widow. In June of the same year, Lilian left for Australia where she died in 1979. So what of ‘Bedmate’? I feel it is unlikely that she is Lilian but of course we can’t discount the possibility that she is, even though she was not born on the Isle of Wight. The final mysteries to unravel here are the cryptic messages she left at the foot of the message. She writes ‘Woodbines’ and ‘W.D. 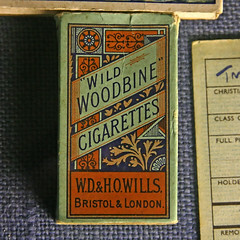 & H.O.’ An earlier investigation revealed that Woodbines (a very popular cigarette once, in Britain) were made by WD & HO Wills. That explains what it is, but not what it means (nor what she may have meant by writing it). If it was a request to bring cigarettes to their Tuesday meeting then it was a little elaborate. There would not be any need to state the initials of the makers, surely. And what is meant by W.H.J.? Google only throws up William Henry Jackson – a New York photographer from that era. Perhaps they knew of his work. The final, and perhaps most intriguing mystery is the signature. Is the card signed Bedmate or is the signature Longyoungen – and what on earth does that mean? If you know anything about the conventions (or otherwise) of sending secret messages by such a public vehicle as a postcard, then please let me know in the comments below. I’m hoping to discover that these words and initials are codes, but perhaps they were known only to Gabe and this young lady, and were not universal to young people of that day. I’d love to hear what you think about these mysteries. I hope you have found it interesting. Categories : Family History, Genealogy, Old Postcards, Research, Who Were They? Harry (or sometimes Kenneth) was born on 14 April 1883 in Marlborough, Wiltshire, England. Unfortunately he does not seem to appear on the 1891 or the 1901 censuses so I do not know who his parents were. He travelled to the USA and returned in 1914 aboard the Lusitania just over a year before the ship was torpedoed and sunk in May 1915. He is listed as a Clerk. In 1923 I found his return from Argentina, along with his wife Carola who I can’t locate in the English records so might assume was born in South America. By now he is a Bank Manager. In 1926 the couple return to these shores again, and Harry is a Clerk for the Bank of London and SA (South America), which is also given as his destination address. In 1935 the couple are here again and are heading for an address in Gloucestershire. Harry is listed as a Railway Employee this time. In 1954 he returns to England form Buenos Aires alone at the age of 71 and it is possible that his wife has now died. I have no idea if there were any children, but certainly none travelled with them on the few journeys I have found (I would guess that they were more frequent than these records suggest). Despite his age, he is listed as a Railway Clerk. Two years later and Harry is back in England again (from Buenos Aires) and is now listed as having no occupation. Presumably he finally retired. His address this time is The Canning Club – a gentlemen’s club in London for those with connections to Argentina. Harry Simpkins died in Islington, London in 1981 at the age of 98. There isn’t a lot of detail but we can piece together a picture of a man who travelled a great deal, who worked and married in Argentina, and who returned frequently to England. We don’t know if he had any children and know nothing of his parents (though this could be discovered by purchasing his birth certificate). Why does he not appear on the two available censuses after his birth? Maybe his connection to Argentina began early in life. It is possible that his father also had connections there and moved the family abroad. Maybe, like so many families, they just didn’t fill out their census returns. The other puzzle is Harry’s change of occupation from clerk to Bank Manager then back to clerk seems fairly straightforward, but then he leaves banking to be employed in the railway industry. By his apparent final return to England he was a member of a ‘gentlemen’s club’ and this might suggest either some affluence, social standing or at least good connections. So was he the manager of a small bank and then a very important clerk after that? Did the railway industry headhunt him? Or did he lose his ‘mojo’ after marriage and slide down the ladder over the years. Or did the Wall Street Crash in 1929 have anything to do with this? I am sure that some of the answers are out there and maybe one day I will extend this project beyond these initial musings. William Walker Gregory, at the time this portrait was taken, lived and worked at 30 High Street, Marlborough, Wiltshire, England, with his wife Louisa and two of his three children – Helen and Florence. There was a son between these two girls but no trace of him after the 1871 census when the family lived in Jersey and the boy was about five years old. William Walker Gregory was the son of William Gregory (born about 1797 in Derbyshire) and Dorcas (I can’t find her maiden name unfortunately but she was born about 1795 in Worcestershire). He was born in 1833 in Huddersfield, Yorkshire, England and was the middle child of three, having two sisters – Mary and Anne. His father was a Master Draper in Huddersfield who died in 1869. By the age of 18 William Walker Gregory was his father’s apprentice and he eventually became a Linen Draper (until at least 1861 and at that time resident at Belmont Terrace, Brunswick Place, Huddersfield). He married Louisa Dyson, daughter of a Cloth Finisher, in 1959. The couple’s first child, Helen Louisa Gregory was born in 1863, then Frederick William Gregory in 1866. At some point between Frederick’s birth and the arrival of their third child, Florence, in 1869, they moved to Jersey in the Channel Islands. On the 1871 census, William Walker Gregory is listed as a Photographer. I have found no record of the death of young Frederick and only know that by 1881 the family were back in England (this time Marlborough, where the above photograph was taken). Frederick would have been about 15 or 16 by this time and it is possible that he remained in the Channel Islands, or that he had moved elsewhere and was working, but we can only speculate. 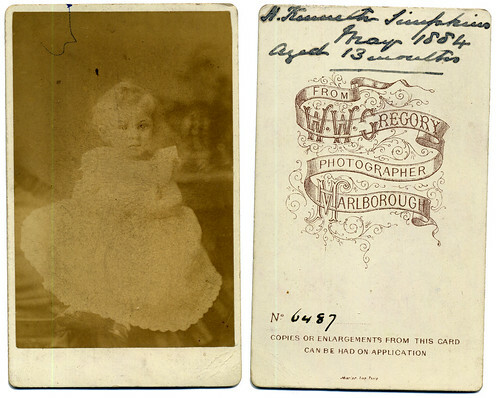 There is a Frederick W Gregory in 1891 in Huddersfield, with a wife, of the right age and birthplace, who is a Photo Dealer’s Assistant, but there is no way of verifying that this is the same person without further investigation. One of the pitfalls of this kind of research is making assumptions – they are always dangerous. Follow up every possibility, but believe nothing until you have proof. Three years after the 1881 census, this photograph was taken. William and Louisa were still at the same address in 1891, but William died in 1895 at the age of 62. In 1901 his widow Louisa was living with their married younger daughter Florence in Lewisham. I can’t find a record of her death. The questions left open from this short investigation are interesting. Why did the family move to Jersey? What happened to Frederick – did he die or did he move back to Yorkshire? And what made William Walker Gregory become a photographer after starting out as a Draper? Perhaps it was a passion of his and he gained a solid grounding in a dependable trade, saved his money for equipment, learned everything he could, until he was able to “give up the day job”. Perhaps there was an opportunity in Jersey to pursue this career, or maybe they moved there for other reasons and he fell into a photographic job. If these people were part of my own family tree then I would dig deeper, purchase birth, marriage and death certificates, and research the local histories of the places they lived relevant to the time period. The purpose, however, of this project (which includes old postcards and letters as well as photographs) is the take away a little of the anonymity of these finds. I hope you have found it interesting. As posts aren’t always regular on this blog it’s definitely worth subscribing to the RSS feed so you don’t miss any updates. The Who were they? project will become a recurring feature along with the On the Window Trail posts about the works of Lawrence Lee. You might also like to take a look at my other blog. Categories : Family History, Family tree, Genealogy, Old Photographs, Research, Who Were They?